This is the number one best-selling mirror in its category on Amazon, and has a glowing 4 star review from over 3000 happy customers. This is small, which means you can move it around your house easily if you redecorate or change the layout of your room. This mirror is only 13 inches tall, however it magnifies to 7x to check all of your details. The light on this mirror comes from all around the oval which provides you with gentle lighting that acts as a soft halo. The chrome is modern and so this would fit into a sleek and chic room, as well as more traditional or vintage styles that also accommodate lighted mirrors. 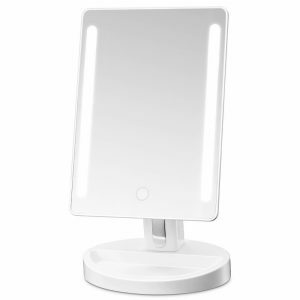 This mirror is double-sided, and uses a cord switch which is so much more convenient than batteries. Plus, at only $25.99, this is a great deal, so it’s no surprise that this is so popular. This mirror is 6.5 inches wide and 8.9 inches tall in a rectangular shape with lights coming down either side. The lights on this mirror are LED, however they are not harsh and fluorescent; instead they are designed to imitate natural light, which is the most reliable way to assess how you look. You can choose between using a cord or a battery, and this is designed to be convenient to use – so you simply tough a sensor switch on the mirror to turn the lights on or off or adjust the brightness. A free portable mirror also comes with this product for 10x magnification so you can use this mirror to look at details as well as simply get ready for work on a morning. Almost 250 happy customers have left incredibly positive reviews, resulting in a 4.2 star rating, plus this mirror is quite the bargain at $30.99. This is one of the highest rated mirrors available on amazon, where glowing reviews have culminated in a 4.4 star rating. 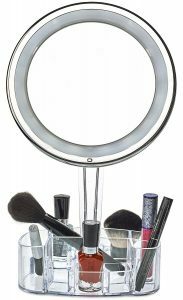 This mirror is circular, and has a 7x magnification which makes it perfect for applying make- up, which is made all the more convenient by the organiser that can store your make up in the base. The LED lights that run around the diameter of the mirror are bright, but they’re also energy efficient and not too harsh. 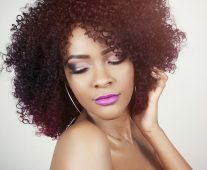 You can move this around the house wherever you apply your make up, as it’s completely cordless and runs on batteries. You can swivel this mirror around to make sure that all of your angles are completely flawless, and you can also enjoy having a stylish piece for your make up table in the morning. The one downside is that this mirror only provides magnified views, so it can’t be used for more normal routine uses, and the mirror is only on one side, it’s not double sided. At $19.95 this is a total bargain for such a useful mirror that you’ll use every single day. This mirror is ideal for anyone who takes getting ready seriously. What’s really outstanding about this mirror is that you get a total panoramic view of your face as you get dressed, as there’s a centre mirror as well as two side mirrors. You can rotate this mirror to match your preferences or focus on any specific parts of your face, so you can look completely flawless. This is really designed to be user-friendly as you can use a touch screen to turn the lights on and off, as well as dim them depending on your needs. 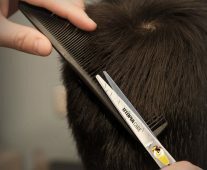 Many customers like the LED lights on this a they are meant to imitate daylight, so they’re not too harsh, but also not too soft that you can’t see where to tweeze or powder. You can make the most of the handy little tray at the bottom to hold your cosmetics, and this is especially user friendly as you can use a cord or batteries to power the lights. 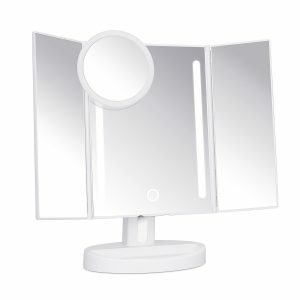 You also get a removable mirror with 5x magnification that you can attach to the mirror with a suction cup if you really want to make sure you look perfect. Most of all, the tri-fold design is really stylish and this is a great deal for $32.99. This mirror is a great mix of contemporary and vintage style, as while the lights are LED, they are in the old style around the centre mirror. 21 LED lights light up the mirror, and you can use either a cord or a battery to power it. 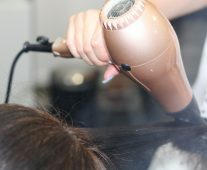 The grip stand is really useful for two reasons, first that it is adjustable and can swivel the mirror up to 180 degrees, and second because the base includes useful containers to hold make up or jewellery. 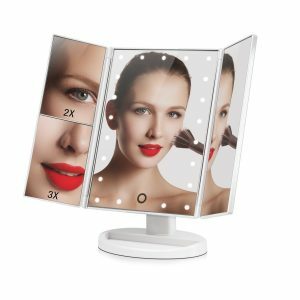 The centre and right side panel of the mirror provide a normal reflection, while the top of the left panel offers 2x magnification and the bottom left of the panel provides 3x magnification, so you can see your whole face and the details simultaneously. Once you turn on the mirror with the switch at the back of the base, you can use a touch screen to turn on or adjust the lights, which is really handy. This trifold mirror looks really cool, it’s extremely easy to use, and best of all it has a 4.4 star rating from over a hundred happy customers. At only $30.99, this is a great deal. 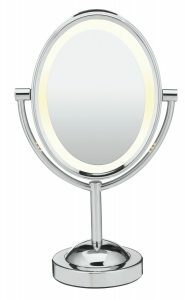 A vanity mirror with lights may sound a little old school, but the truth is that they look great, and are incredibly useful tool when applying make-up in the morning.